A decade of tragedy; in the space of a few short years, almost ten million young men died on the battlefields of Europe, with 200,000 losing their lives on the fields of Flanders. Yet it was also a decade of triumph and creativity. When King Edward VIII died in 1910, he was succeeded by his son George V and his wife. George’s elder brother had died of pneumonia in 1891, and so George not only took over as heir to the throne, he also appropriated his brother’s fiancée, Princess Victoria Mary of Teck. It seems to have been a happy marriage and by the time they were crowned in Westminster Abbey in 1911, they had six children, amongst them the future George VI, father of our present Queen Elizabeth. George V and Queen Mary (as she was now known) reigned for twenty-six years. Not long after Edward died, the skies were illuminated by a bright light when Halley’s comet made a spectacular reappearance. At one point the earth actually passed through its tail, causing the press to weave sensational tales of cyanide poisoning as the tail contained a poisonous gas. Naturally, it was a false alarm, though some people maintained it was a bad omen, nodding with satisfaction a few years later after two major disasters of the decade – the ‘Great War’ and the sinking of HMS Titanic – seemed to have proved them right. HMS Titanic was launched with great ceremony on 1911, but just a year later struck an iceberg on her maiden voyage and sunk with a loss of 1502 lives. 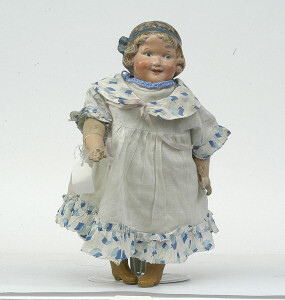 During the earliest years of the decade, beautiful German dolls filled the toy shops. Manufacturers such as Simon & Halbig, Schoenau & Hoffmeister, Heubach and Armand Marseille produced vast numbers of bisque china dolls, often finely painted and exquisitely dressed. The Germans had cornered the market at this time, their faster production methods and flair for business gradually squeezing out the French dolls, but when the war started, there were importation restrictions on their goods, including dolls and toys, which meant British and ‘friendly’ countries needed to fill the breach. 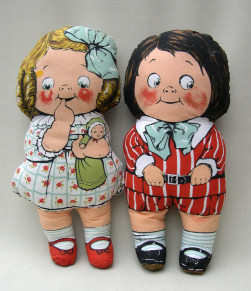 Half-dolls were beginning to be popular during this decade, often referred to as ‘tea-cosy dolls’ or ‘pin cushion dolls’. Some of them were very delicate, made by famous porcelain manufacturers, and they topped items such as cakes, brushes, pin cushions, powder puffs and tea-cosies. In 1913 Mary Phelps Jacob, an American socialite, constructed the first brassiere from two silk hankies and some ribbon, to wear under a sheer evening gown. At last women could discard their restricting whale-boned corsets (though not without a fight by many shocked ladies). That same year, the zip fastener appeared, honed to perfection from a much earlier invention, as well as the crossword puzzle, which at last gave people something to do during their coffee break. And in 1915 a character was dreamed up by Johnny Gruelle, who would bring pleasure to generations of children – Raggedy Ann. The assassination of the Austrian Archduke Ferdinand and his pregnant wife in Sarajevo 1914 was the trigger for hostilities to start. Young men rushed to sign up to fight, all believing it would be a bit of ‘harmless sport’ and be over by Christmas. It wasn’t, of course, and as those fresh-faced youths faced the horrors of the war trenches, their women folk back home had to take over the mens’ jobs in factories, banks, farms and businesses. They were also marshalled to act as auxiliary workers in the armed forces, so freeing the men-folk to fight at the front. The majority of the women had never worked before, and this was an unknown freedom. Not long after the end of the war, women over thirty were given the vote for which the suffragette movement had long been campaigning. The gap in the market due to the hostilities with Germany was swiftly filled by Japan who sent bisque and celluloid dolls to Britain. The majority of these dolls were crudely made of a coarse white bisque. Many little girls enjoyed assembling collections of the smaller dolls which were sold cheaply in toyshops and newsagents. 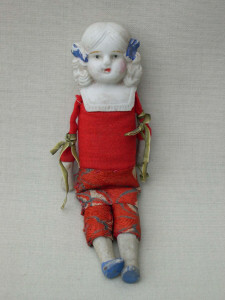 Sometimes the dolls were made completely of bisque, but often their bodies were cloth. These unsophisticated Japanese dolls have a charm of their own, though some of their dolls were very fine and beautifully painted. 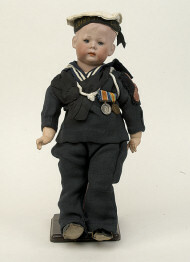 Various patriotic dolls, often made from cloth, appeared during the war years, dressed in uniforms such as a ‘Tommy Atkins’ figure to represent a soldier. Sometimes a mother would dress a bisque doll for her child in a replica of her father’s uniform, as a reminder while Dad was fighting at the front. 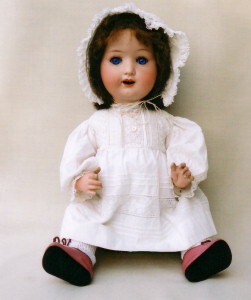 Britain tried to emulate the unavailable bisque German beauties but with little success, with manufacturers such as Goss making various china-headed dolls. Goss dolls were quite pricey, and once the war ended and German dolls were imported again, Goss ceased production. In 1917, the Russian Revolution had led to the abdication of the Tsar, Nicholas II. Refused refuge in Britain, he was murdered by the Bolsheviks six months later, along with his wife and children, as symbols of the old Russia. Over the years, several women have claimed to be Anastasia, the youngest child, who was rumoured to have survived the shooting. Other notable events included the invention of traffic lights in 1911 and parachutes in 1912. In 1919 speedy breakfasts were achieved by the creation of the pop-up toaster. Three years before, the first Women’s Institute in Britain was established in North Wales, while young girls were able to emulate their Boy Scout brothers in 1910 when the Girl Guides’ Association was founded by Sir Robert Baden-Powell. Six years later, he completed the hat-trick by founding the Cubs for younger boys. All in all, this was a tumultuous decade which revolutionised women’s lives. When the men finally returned from the trenches, their lady folk were reluctant to return to their closeted lifestyles after having known freedom outside the home.